The effective conference time will be the same, but Confer Call eliminates the waste surrounding the real topics that need discussed. No elaborate communication upfront, no waiting for participants to join. This time saving will be highly appreciated, by your customers and by your employees. The Confer Call setup will save you at least 30% of the time spent on a conventional conference call. Conference calls last on average 20 minutes; 7 minutes are used on getting to it and making sure everyone is in the call. Confer Call eliminates this waste. With Confer Call you only pay for actual use. There is no subscription fee, and no fee for setup of your account and keeping it available. The minutes used are charged. For just 5 eurocents per minute per participant. A huge saving, especially for conference calls with a distributed team partly based abroad. And be advised, Confer Call uses regular phone lines, no questionable VoIP connections. The content is up to you. But our call management interface does have some nifty features like dialing-in new participants mid-call. Straight from your address book. Also, Confer Call has a more secure setup. As the conference call is not accessible through an inbound number, there is no way to join in for uninvited guests. You hold all the aces. Every employee is assigned a credit. All calls are neatly listed, with associated costs. Employees no longer have to report expenses. 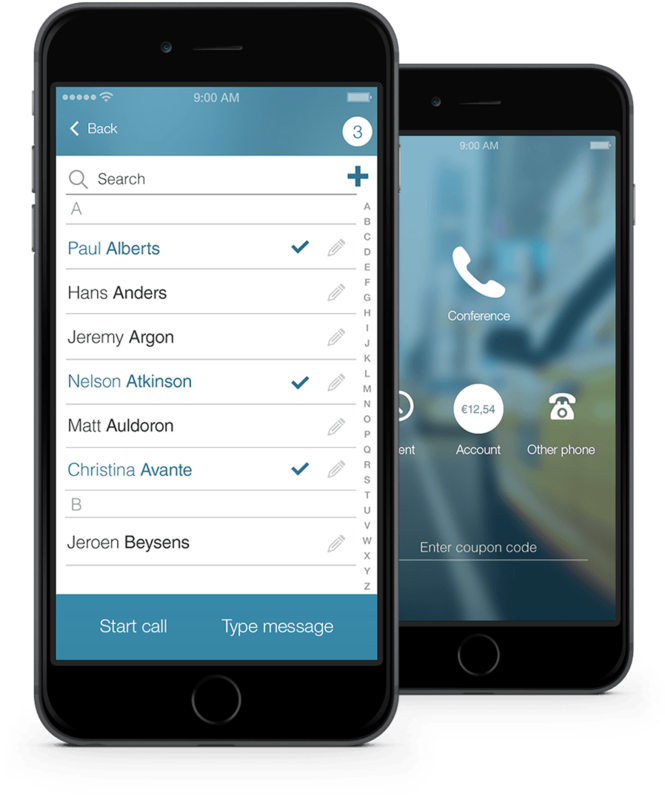 Confer Call is mobile based so you can start a conference call through the app anytime, anywhere. Always accountable, and always within budget. Mind you, we were users first, looking for the best way to call a group. We tried many suppliers and were never utterly enthusiastic about the service. Using 0800 and 0900 service numbers, most of them were just too expensive: up to $2 a minute, and that is on top of your subscription fee per minute. They were a hassle to set up: codes were lost, people signed in too late, and pin codes were wrong. Because they are call-in-based, everyone with a pin code can listen in. Always has the same low cost: 5c a minute per person. Is easy to set up and can be instantly executed: add people from your address book and call. Is call-out-based, so no one is late, and there is never an unseen guest listening in.